THE Coco Fuzion 100 Southsea Trophy has filled me with confidence ahead of Wimbledon. That is the verdict of Katie Boulter who makes her second appearance in the third and most prestigious Grand Slam of the season. Boluter will take on Veronica Cepede Royg in the first round – their match schedule for today. The 21-year-old heads to SW19 in fine form after finishing runner-up in the Southsea Trophy last week. Boulter, who hails from Leicester, was defeated 6-4, 5-7, 6-3 by former Wimbledon semi-finalist Kirsten Flipkens in the final at Canoe Lake. 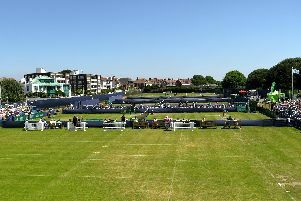 Currently ranked 144 in the world, she believes her effort at the Southsea tournament has given her the perfect preparation going into Wimbledon. Boulter said: ‘I have put a lot of work in this year and this week, in particular, I have been so relaxed. ‘My game is developing and I’m looking forward to testing it at Wimbledon. ‘Once again it is another opportunity, like last week, and I will be going out there to give it my best. ‘I’m going in with a lot of confidence. ‘I played a lot of top players in Southsea and it has helped me. ‘I’m definitely ready. It was a great week for me and I can’t complain. Boulter will fancy her chances of reaching the second round at SW19. Her opponent Cepede Royg is only 25 places higher in the world rankings. Although Boulter doesn’t know much about the Paraguayan, she will ensure she does her due diligence heading into the clash. ‘I don’t really know much about her,’ added the Brit. ‘I’m sure my team and I will sit down and look through her footage. ‘But it’s about my game and I’m going to go on court and enjoy it. ‘It’s a really special feeling stepping out at Wimbledon.